inscription: "By Jason Hunt" is printed at bottom right below the image. "(c) 1994 North West Publishing Corp., Orlando FL 32809 (407)240-1091" is printed at bottom right, and "16-502" is printed at bottom left. 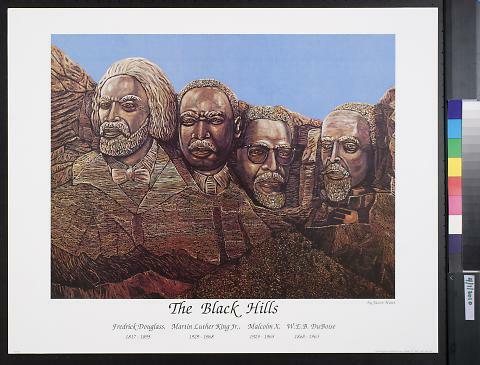 Multi-color poster contains an artwork on a white background that shows four men's faces carved into a mountainside, similar to Mount Rushmore. Text below the image at bottom center reads, "The Black Hills / Fredrick Douglass, 1917-1895, Martin Luther King Jr., 1929-1968 / Malcolm X, 1925-1965, W.E.B. DuBoise, 1868-1963."